Definition of isosceles triangle and examples. 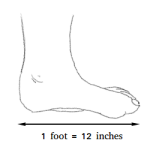 An isosceles triangle is a triangle that has two congruent sides, or two sides of equal length. 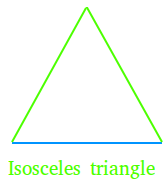 In fact, the word isosceles came from the Greek word " iso" meaning "equal" and the Greek word "skelos" meaning leg. The sides that are equal are shown with the green lines and the base is shown with the blue line.